today i am back with an ATC card made for my Nov partner in fb ATC grp. 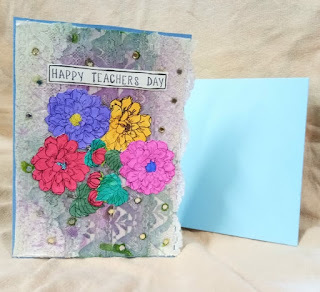 theme was to make card using watercolour. So, i used Calmin brush pens to make the stencils as background and cut them into strips to make a weaving pattern. The girl, sentiments are all stamped and watercoloured. I am very much new to watercolouring , so i am not much satisfied with the girls hair.. Entering my work to the challenge in Itsy Bitsy blog.. They have a challenge based on the theme - Stencil from ItsyBitsy. I have used script Stencil in background and made a weave pattern out of it . Stamped girl is from My little Darlings bought from Itsybitsy and so is the alphabet stamps.